On the anniversary of the assassination of Mahatma Gandhi, 30 January, we still try to find ways to resolve conflicts peacefully and to deal with violent religious movements and individuals. Gandhi was assassinated by Nathuran Godse, a member of the military-like RSS which still plays an imprtant role in current Indian politics and ideology. Mohandas K. Gandhi was born into a political family. His father was diwan of the small princely state of Porbandar. The diwan was the combination of prime minister and chief administrator — a function that was often passed on through the family. While Gandhi’s father died while he was finishing high school, the broader family saw the future of Mohandas as a political administrator, perhaps of an even larger princely state. As British control of India was growing, it was useful for a future political administrator to have an English law degree and to have seen English ways first hand. Thus in 1888 he was sent to England to get a law degree. He took his studies seriously and passed the examinations ranking high in his class. He acquired a taste for jurisprudence and for arguing in a legal way. Gandhi understood that a course of legal study was merely the gateway to a profession in which acumen, initiative and accumulation of experience would be factors deciding success. Gandhi had promised his mother to continue the family’s strict vegetarian diet and so he found vegetarian restaurants in London and made friends. He joined the editorial board of the newly-created The Vegetarian journal and started writing articles on Indian food. The journal editor, Josiah Oldfield, was a practicing barrister and social reformer. Through Oldfield, Gandhi met Edwin Arnold, author of a verse biography of the Buddha, The Light of Asia, and a verse translation of the Bhagavad Gita The Song Celestial and a verse life of Jesus The Light of the World. The Jesus of The Light of the World was not a god come to earth but a man who achieved perfection through renunciation and selfless love and thus became divine. Sin is imperfection and disappears as man become perfect. Gandhi was also introduced to the Theosophical Society, meeting with Madame Blavatsky who was then living in London and Annie Besant, whom he would again see in India after his work in South Africa. Gandhi was particularly friendly with Archibald and Bertram Keightley, uncle and nephew, who had edited Madame Blavatsky’s The Secret Doctrine for publication in 1888. Madame Blavatsky’s The Voice of Silence was published shortly after Gandhi met her, and the book was an influence in his work in South Africa. The Voice of Silence is a collection of aphorisms which elaborated the doctrine of liberation through service to others, and introduced into theosophy the Buddhist concept of the bodhisattva — the enlightened being who postpones indefinitely his entry into nirvana, in order to serve others. The voice of the silence is the inner voice heard by the sufficiently pure, the voice of ‘thy inner God’, the ‘Higher Self’. It leads the hearer ‘unto the realm of Sat, the true. After a short stay in India, Gandhi was called to work on a civil suit concerning Indian merchants in South Africa. He left for South Africa, thinking of spending one year. He spent 21 years in South Africa and left with an international reputation which he was eager to put to work in India. It is from Trine’s writings that Gandhi received the term “soul power or soul force” — the term Gandhi translated from English into the Indian term satyagraha. Satyagraha is most often translated today by the term non-violence, but there was already in use in India the term ahimsa — a meaning non and hinsa violence. Gandhi wanted another term that was more active, and he took from Trine the term ‘soul force’. Once Gandhi returned to India in 1915, in order to develop popular support, he had to find Indian, particularly Hindu, colourings for his ideas. Gandhi’s renderings of traditional Hindu beliefs can be understood in the context of Esoteric Christianity (and theosophy, where the two systems overlap). Such unorthodoxies include Gandhi’s very positive notion of rebirth as an opportunity to strive for spiritual improvement; his version of the Hindu concept of avatar, which he expounded particularly in his writings on the Gita , as a mortal man who achieves perfection, rather than as a flawless incarnation of God; his polite but persistent refusal to find a guru, and insistence that each individual is responsible for his own spiritual development; his claim that he, who was not even a Brahmin, was entitled to interpret the Hindu scriptures with only his purified conscience for a guide, and treatment of the Mahabharata and Ramayana as inspired allegory; his substitution (with varying emphasis at various times) of the notions of service, sympathetic suffering and renunciation for the traditional Hindu notion of yajna (sacrifice in the sense of an offering to God); his conflation of Indian ascetic practices (tapascharya) with an un-Indian aspiration to condition the body for spiritual effort. Gandhi regularly proclaimed his ambition to see God, preferably face to face in this life. His use of the term was Esoterically Christian. ‘Seeing God’ he wrote ‘means realization of the fact that God abides in one’s heart.’ The man ‘who sees God in the whole universe’ he also wrote ‘should be accepted as an incarnation of God.’ For Gandhi seeing God was both the critical experience on the way to becoming one with God, and also, in its final fullness, the end point of that journey, when God would take over for the time he remained on earth. While Gandhi was ‘Hinduizing’ his public persona and his manner of life with deep appeal for many ordinary Indians, his efforts at satyagraha ‘soul force’ – non-violent action- never attracted Hindu religious leaders. Gandhi’s close co-workers were non-religious like Jawaharlal Nehru, Muslims like the ‘Frontier Gandhi’ Abdul Ghaffar Khan and non-Indian Christians like Madeleine Slade and C.F. Andrews. Rich Hindus like G.D. Birla gave money to the cause of Indian independence and Gandhi’s leadership but were not close co-workers. There were no gurus on the frontlines of protests, and finally, it was a member of a militant Hindu movement, the RSS, Nathuran Godse, who killed Gandhi on 30 January 1948. The 32 years of non-violent effort to liberate and reform India ended for Gandhi in the Hindu-Muslim violence which followed the partition of India and Pakistan, leaving 15 million refugees and half a million dead. Gandhi and many others shared the blame for these horrors. Despite his unorthodoxy, despite his friendships and alliances with Muslims, he was seen as ‘Hindu’ politician, incessantly invoking Rama and publicly embracing the ascetic practices associated with Hindu holiness. The message he wanted India, as a nation, to broadcast to the world was a mixture of Hinduism and Christianity, philosophically alien to Islam. He never dissociated himself sufficiently from the Hindu communalist wing of Congress. He demurred at being treated as an avatar by the masses, but left no doubt that his spiritual aspirations might as well be so understood by the ignorant. In the early months of 1946, as communal hatred smouldered in India, he was touring the country holding vast prayer meetings, complete with mass chanting of the Ramdhum, which were now his preferred means of exposing himself to the crowd. He saw the chanting as a form of synchronized spiritual experience, evoking the power of silent thought and connecting the mob to God. When he began to include readings from the Koran, fanatical Hindus turned up to heckle. Communal feeling, however high-mindedly invoked, was a tiger he could not ride. During the 1940s until his death, Mahatma Gandhi concentrated his efforts on Hindu-Muslim reconciliation as there was a growing feeling of rejection among the Muslims and thus their desire for a separate state—Pakistan. Gandhi did not see the growing rise of Right-wing, narrow and violent Hindu communalism. His close associates either did not see the dangers of fundamentalist Hinduism or did not discuss it with him. Unfortunately, Gandhi surrounded himself only with “yes men” and more often by “yes women” who were not in touch with the violent movements among the Hindus. There were no representatives of orthodox Hinduism in his entourage nor did orthodox Hindu religious leaders take part in his satyagraha campaigns. When he was warned by the police that Hindus might kill him a few weeks before his death, Gandhi refused armed police protection. Thus it was that Nathuram Godse greeted Gandhi in the traditional Hindu way and fired the killing shots. Gandhi had said “A bullet destroys the enemy; non-violence converts the enemy into a friend”, but he had had no time for such a conversation. As has been said before, there is no guarantee that non-violent action will succeed, no more than violence is always successful. 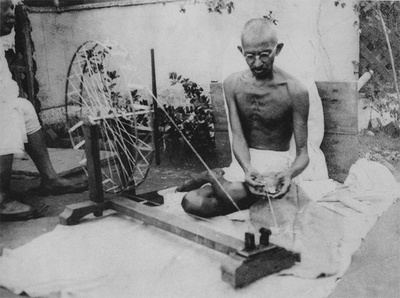 Gandhi viewed spiritual and political efforts as united through many of the people he worked with saw them as separate. Most of the leaders in the movement for independence of India were concerned with the political dimension. Yet, for Gandhi, the spiritual and political means were interdependent and could not be separated. Today, religious movements are often seen as promoting violence, Islam in the Middle East, Buddhism as an anti-Muslim current in Burma. The anniversary of Gandhi's death is an opportunity for us to weigh motivations, processes of action and goals to be obtained. Thank you for Honoring this truly Great Soul, and the Ripple Effect of his Voice and Life's Actions and/Non-Actions.